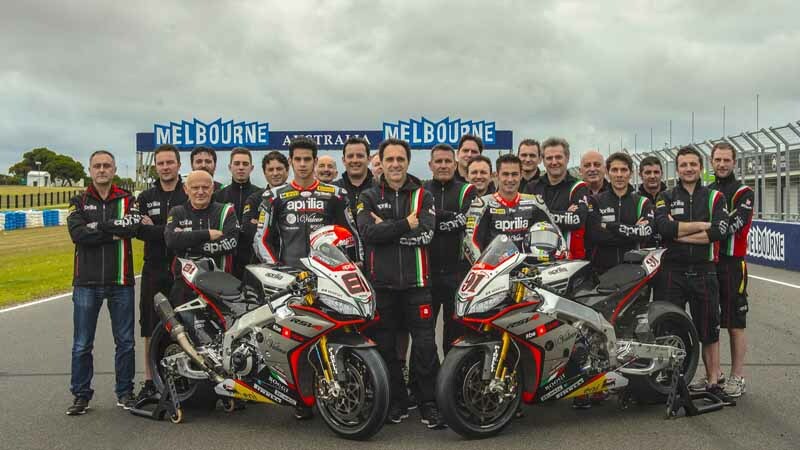 Phillip Island (Australia), 18 February 2015 – The 2015 World Superbike adventure for team Aprilia Racing – Red Devils kicks off on the Australian Phillip Island track. The Italian brand – reigning world champion after winning the 2014 championship with the double Rider-Manufacturer world title, taken at the last round in Doha – is ready for the 2015 season with a revamped structure and two riders making their début on the Aprilia RSV4, the bike that has dominated WSBK in recent years. Aprilia’s world Superbike trophy case is quite impressive: 7 world titles won in just 5 seasons from 2010 to the present. This is an undisputed supremacy in the factory derivative segment that has contributed to enriching the global trophy case in the halls of Aprilia which, with 54 world titles in the various sport motorcycling disciplines (grand prix motorcycle racing, Superbike and Off-road) is one of the most victorious racing divisions of all time. On the number 91 Aprilia RSV4, managed by Crew Chief Enrico Folegnani’s team, is English rider Leon Haslam. The thirty-two year old from Ealing, runner-up world champion in 2010, has already had the chance to show his potential astride the V4 from Noale during the winter tests. On the other side of the garage, under the technical supervision of Lucio Gomes and making his début in World Superbike, is twenty-seven year old Spaniard Jordi Torres on the number 81 Aprilia RSV4. Aprilia’s new Superbike season gets underway, like last year, under the supervision of Romano Albesiano who manages all of the Piaggio Group’s racing activities. In a year where Aprilia Racing’s efforts will be doubled – after making their début in MotoGP a year ahead of the originally announced schedule – Paolo Bonora will be the Project Leader SBK, whereas the Aprilia SBK team management structure will be completed by Dario Raimondi as Team Coordinator, and Andrea Petricca. The Aruba.it Racing – Ducati Superbike Team prepares for Phillip Island season opener.